Working horses have been used for thousands of years in industry to help move heavy objects. More recently the horses have been used in coal mining, to deliver beer, pull trams and carriages and move narrow boats around the canals of Europe. Now the Leeds Flood Alleviation Scheme’s natural flood management project has the help of Ghalm to prepare the materials required to continue this important work. Ghalm is one of a team of horses which have been used at other natural flood management sites such as Hardcastle Crags in Calderdale. Harden Moor is one of the pilot natural flood management sites being delivered throughout the River Aire Catchment as part of the Leeds Flood Alleviation Scheme, led by Leeds City Council in partnership with the Environment Agency, which has a catchment wide approach to flood risk as it enters its second stage. This £500,000 pilot programme, which has been funded by Leeds City Council, uses natural methods to slow the flow of water from upstream in the catchment. This includes land management to reduce water run-off, woodland creation to increase tree canopy cover and river and flood plain restoration so that the landscape can hold more water in times of flood. On Harden Moor, the Environment Agency’s project team are working in collaboration with Bradford Council to implement and deliver natural flood management on council owned land. The natural flood management design for the site has been developed by Bradford Council as the lead local partner in the White Rose Forest joint venture. It includes interventions such as tree planting, wetland creation and the installation of leaky barriers to slow the flow of water into Harden Beck which is a major tributary to the River Aire. The wider project aims to reduce flooding downstream including in Bingley, Saltaire, Shipley, Esholt and Apperley Bridge. Native oaks are also being planted at the site to help slow the flow of water. We are delighted that this tradition is now being extended to the work at Harden Moor and we are very grateful for the opportunity to work with Ghalm as it will be a huge help to us when delivering our flood alleviation measures. This work at Harden Moor will contribute to local flood risk reduction and wider environmental benefits, slowing the flow of water locally and to downstream communities. The design we developed ensures that the improvements to the site are sensitive to the surrounding landscape and existing habitats are retained. It includes blocking drainage features and constructing leaky dams to reduce run-off and surface erosion, as well as creating woodland areas and planting sphagnum to increase water absorption. This land management maximises technique uses natural regeneration and re-wetting of heathland areas so that the landscape can hold more water in times of flood. 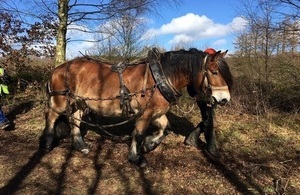 The use of Horse logging is a really environmentally sensitive way to moving felled and fallen timber whilst reducing damage to flora and watercourses without pollution so it’s great that we can use Ghalm in this way on our moorland to benefit areas downstream from Harden which include large areas of the Bradford district before the river reaches Leeds. Harden Moor is one of several pilot sites which will allow the team to be able to do monitoring and research of the techniques and gather evidence to increase their understanding and the benefits they give to reducing flood risk. The pilot programme is also being used by the Environment Agency and Leeds City Council to develop a co-design approach to working with landowners, tenants, local authorities and key stakeholders such as the Aire Rivers Trust and the White Rose Forest partnership. This will help to then develop future plans for the catchment. Working with natural processes to reduce flood risk, known as natural flood management, is an important part of managing and reducing flood risk in a sustainable way alongside more traditional engineering solutions. The interventions will also create habitat for wildlife and help regenerate rural and urban areas through tourism. Phase 2 of the Leeds Flood Alleviation Scheme has a strong focus on natural flood management, with proposals to create new woodland areas which would more than double canopy coverage in the River Aire catchment.